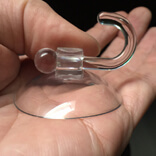 Medium suction cup hooks. 40mm diameter. 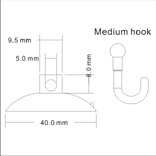 Medium suction cup hooks is an object which employs the negative fluid pressure to firmly stick to the material or nonporous surface by creating the partial vacuum. 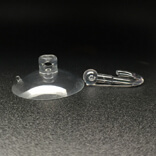 The main face of the Medium suction cup hooks is made of flexible material just like elastic. The suction cup is commonly referred as the sucker. 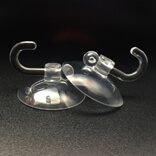 The characteristics of suction cup are similar to sea animals such as octopuses, and squids. 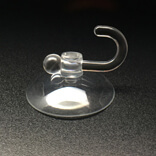 The center portion of the Medium suction cup hooks is pushed towards the flat and smooth surface, then the space between the surface and the Medium suction cup hooks is significantly reduced, that causes the air or water pressure between the suction cup and the material is expelled out. Before placing the Medium suction cup hooks to the static plane, make sure that the surface should be neat and clean. In our day to day life, we are using the Medium suction cup hooks in almost all places such as kitchen, refrigerator, bathroom, office, etc. So we have to choose the best suction cup. Kingfar Solution is the best choice. This company holds one of the top ten positions in manufacturing suction cups for numerous applications. Kingfar’s products are widely exported to Europe, Japan, Korea, USA, etc. The size of this piece is 40mm diameter, and the product is made of PVC material having plastic hooks. Using this Medium suction cup hooks, you can easily arrange the things in your home. Transparent glass, tile surface, stainless steel, refrigerators, tables are the suitable places to use the suction cup for material handling and positioning applications. It is extremely durable and perfectly finished with plastic. 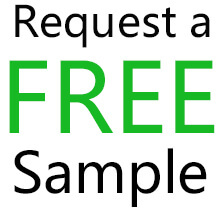 The raw materials used are having high quality and imported from Japan.